This has been the final week of my CEP 810 class, so here is a short reflection on the experience. What immediately comes to my mind when I think back on the class are the small but nice changes I’ve made in lifestyle, for example using the app Wunderlist and checking my Feedly account every morning. 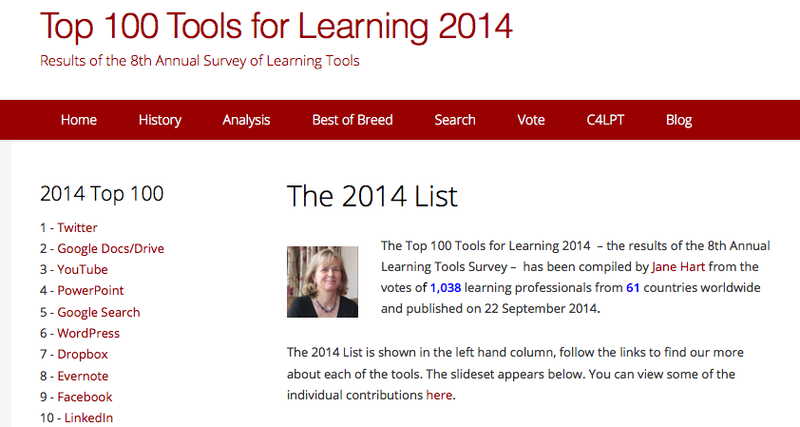 I’ve also enjoyed reviewing the list of top 100 learning tools from The Centre for Learning and Performance Technologies and thinking about how to incorporate some of these resources. My instruction has been most directly effected from the course when I used my 21st Century Lesson Plan in class. With the exception of that, the effects on my classroom are not completely clear yet. This course has made somewhat of a stockpile of resources that I’m still figuring out how best to utilize. Teaching, this course and the start of the wrestling season have kept me busy, but I’m excited for the implementation of more technology within my classroom. Deciding what are the most meaningful ways for this implementation are the largest questions that still loom for me. My students are presented with enough technology in their lives that I don’t want to just be giving them another gadget or a superfluous assignment just to use technology. I want it to be planned out and purposeful. Some of the parts about this course that I have truly enjoyed are the time that we were given to play around with assignments and have fun with them. Although I’m separated from most of the other students by thousands of miles, I still felt very connected with the other students and routinely inspired by their passion for teaching and improving their abilities.